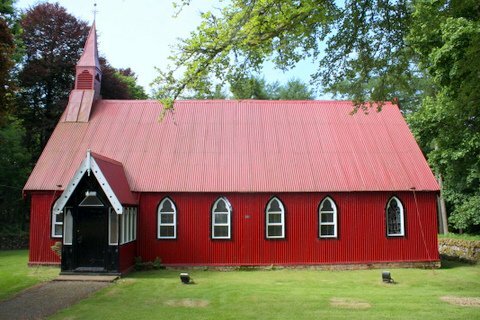 Dalswinton Village Hall is the perfect location for a wedding with a difference because in addition to the hall, the Barony Church is just a two minute walk. 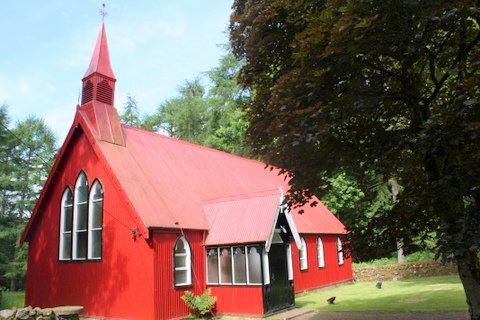 Built in 1881 it is one of the few remaining examples of “tin” churches, popular in the late 19th and early 20th centuries, made in kit form in Scotland. The interior is timber lined offering a warmer and more intimate atmosphere for your special day than conventional stone churches. Hiring the hall for your wedding breakfast allows you to provide your guests with alcohol without the usual hotel corkage charge, and if no charge is made for alcohol, no licence is required. Seating for 90, complete with an organ and magnificent stained glass windows, no-one can fail to be enchanted by this fairy tale church nestling in the woods. Perfect for after ceremony photos. There is a wide variety of accommodation for wedding guests from stylish hotels to country inns and everything in between all within a 20 minute radius of the hall. There are several golf courses nearby for your guests entertainment and a ten minute walk from the hall takes you to the loch on which the first steam boat was trialled, complete with a full size replica.